H. Moser & Cie Swiss Alps Minute Repeater Tourbillon. Earlier this year, H. Moser & Cie unveiled a stunning new minute repeater timepiece in its distinctive cushion-cornered rectangular Swiss Alps watch case. The timepiece, the H. Moser & Cie Swiss Alps Minute Repeater Tourbillon, houses an all-new rectangular movement and is made strictly to order. The watch as seen here is crafted in 18-karat white gold. Buyers of the H. Moser & Cie Swiss Alps Minute Repeater Tourbillon (Ref. 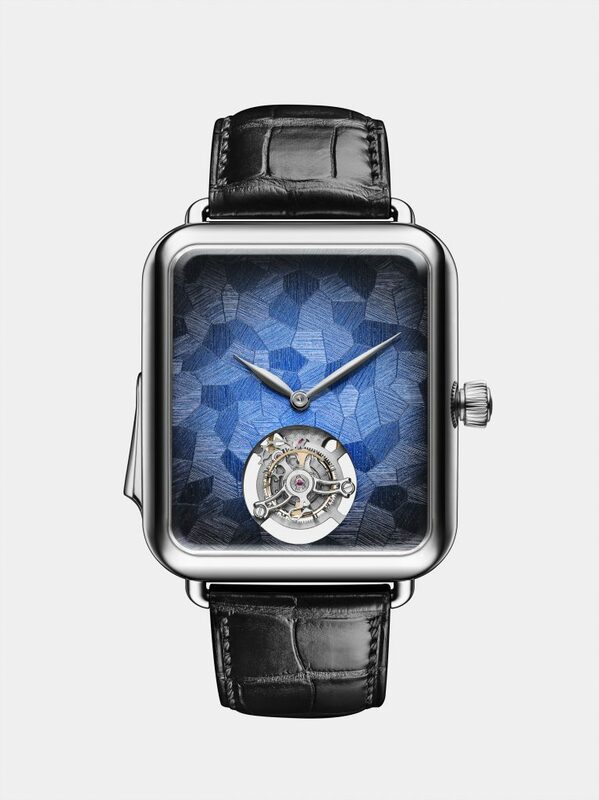 5901-0200) can select the dial colors that are lasered onto the dial to create a mosaic effect — making each piece unique. The C 901hand-wound movement with one-minute tourbillon and minute repeater was crafted in conjunction with MHC Manufactures Hautes Complications SA. View the video below for a complete explanation by H. Moser & Cie’s Michael Margolis about the $292,000 Swiss Alps Minute Repeater Tourbillon, and to hear the chiming.